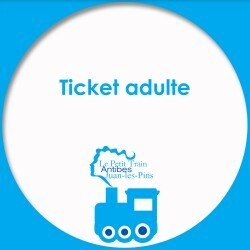 Enjoy the tourist Antibes Little Train in order to cross this town which is situated in an exceptional geographical location and is rich in past treasures. Enjoy a spectacular view of one of the most beautiful sites of the Côte d'Azur. 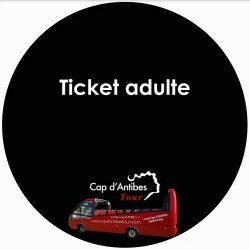 Traveling at a moderate speed, in an open-top bus, the Cap d'Antibes Tour offers you a guided panoramic visit in 10 languages, in the heart of Cap d'Antibes. 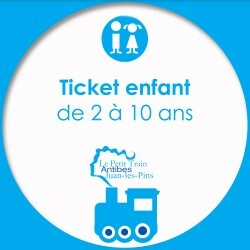 Your ticket will be valid in the months of purchase until use. Choose your fashion discover the city of Antibes. 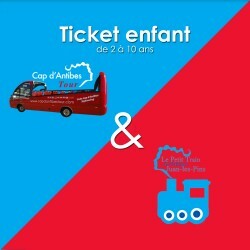 In Petit Train to discover the old town and Juan les Pins or Bus convertible to discover the Cap d'Antibes and exceptional views. Buy tickets by selecting the desired product and get web exclusive rates . 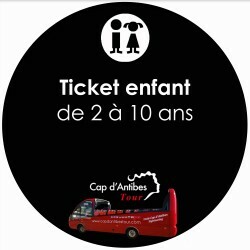 Remember to present your voucher at the time of the visit. En poursuivant votre navigation sur nos sites, vous acceptez l'installation et l'utilisation de cookies, notamment à des fins promotionnelles et/ou publicitaires, dans le respect de notre politique de protection de votre vie privée.